Cheddar Biscuits or Red Lobster biscuits are super easy to make and tastes awesome. Its a great and quick snack to make and serve for your kids and family or to surprise guests who drop by. It takes less than 20 minutes to make and tastes pretty good. Preheat oven to 450 F before mixing. In a bowl add Bisquick mix cheddar cheese, garlic 1/4 tsp and milk to mix. Mix these ingredients gently by not giving too much pressure. When the dough turns sticky it is the apt state of consistency that is required. Dough should not be over mixed since too much of mixing will result chewy biscuit. If you mix it very gently you will get a fluffy biscuit. Now take a small portion about lemon's size and place them in the baking parchment sheet leaving enough place between each biscuit. Place the baking tray in the oven and bake this biscuits for about 8 to 10 minutes until biscuits are golden brown. Simultaneously, melt the butter, add garlic powder 1/4 tsp, dried parsley and mix well. Turn off the oven, when biscuits are ready. Take them out and coat with butter mixture and place the tray back in oven for a golden finish. This step is not really required, but still you will get golden finish. Serve them warm accompanied with salsa. The intensity of the heat required varies based on the make and model of your oven. Please check the manual and heat it up accordingly. 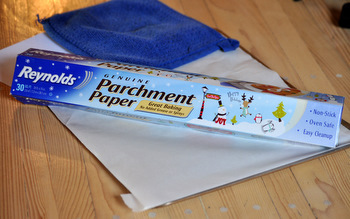 Usage of parchment paper inside the oven could lead to a fire hazard. Keep monitoring it often and remove / replace the paper if you find it turning brown. Needless to mention is the usage of gloves and proper caution while handling the tray kept in oven and the hot biscuits as well.